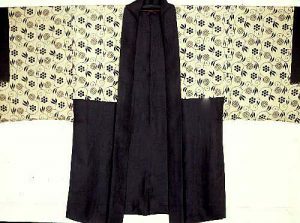 This Obi is typical of those Obi that are often used in a “tied” position in order to display all aspects of the design. The Japanese Obi is considered the most important and often the most costly accessory of Japanese dress. The traditional Obi utilized two specific ties dictated by society; the butterfly tie (for younger girls) and the flat knot in the back tie for older women. 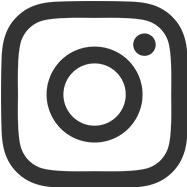 The evolution of the Obi’s design shape led in time to the development of the Nagoya Obi, a remaking of the shape in order to allow the wearer a less complicated exercise in dressing. The young, especially, rebelled at wearing the heavy and constricting Maru Obi or submitting to its extreme and rigid confinement. 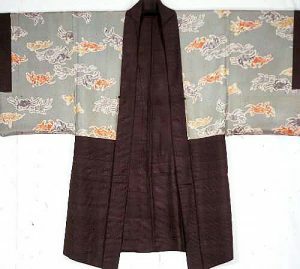 It was during the Meiji Era (1867-1912) that women began to fold their Maru Obi in such a way that two-thirds of the Obi was half the width of the original Obi in order to make it easier to tie. This style caught on, and by the Taisho Era (1912-1926), the Nagoya Obi had its own production line. 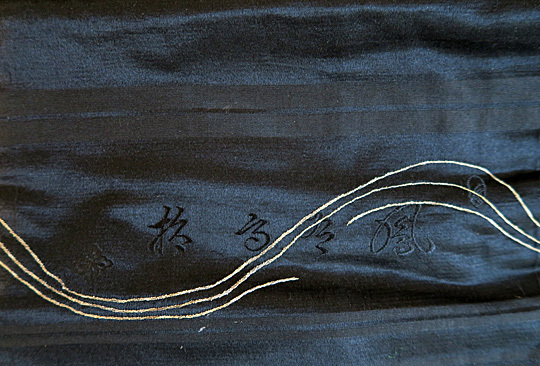 The advantages of the Nagoya Obi weren’t just the wear ability, but also the lesser expense of limiting the amount of woven silk needed for the whole piece. 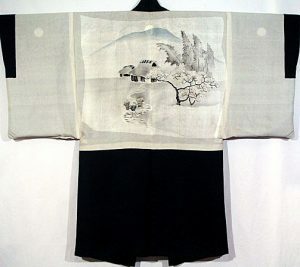 Black was an especially favored color among Obi in general, as it presented a foil for the more elaborate embroidery that often adorned the Nagoya Obi. If the design were more sophisticated, the new simpler style might be more acceptable. The intricate design of leaping Fish (Koi) or Carp is a very powerful symbol in Japan, especially in families with young sons. It is often the picture that appears on Boys Day Banners flown on May 5th each year (what was known as Boys Day and is now Children’s Day) because it represents the strength and perseverance of the Carp as it fights its way upstream and encourages the same determination in the young people of Japan. 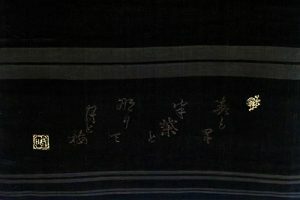 At the bottom of the Obi, woven in the design, is the signature of the Master Weave, indicating that this Obi was intended for a prominent family. Also included is the Family Crest (Mon), which is quite unusual for this type of Obi. The Crest is a combination of the Karabana or China Flower and the Diamond which have been melded into a four petaled flower diamond design. 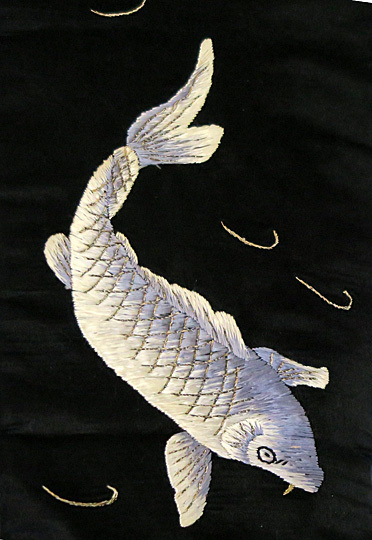 Heavy Satin Silk with hand embroidered leaping fish. The display side of the Obi is in very good condition, while the reverse of the wider section has numerous small holes. Creates an unusual and stunning wall hanging, either vertically or horizontally, or extraordinary table or chest runner. 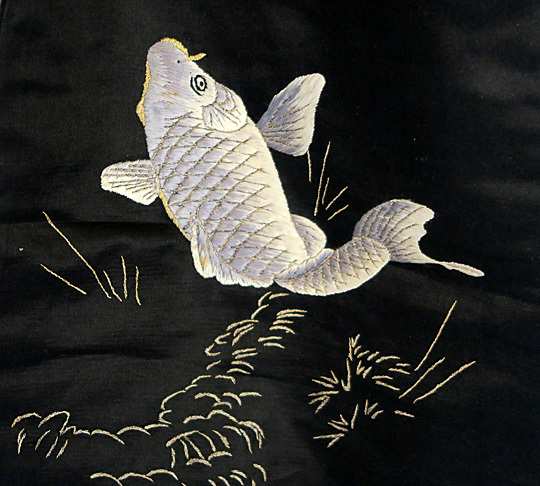 It could also be tied in one of the traditional Japanese styles or the Carp could be individually framed.